A fifth victim has died following the gun attack on the Christmas market in the French city of Strasbourg, the Paris prosecutor's office has said. His brother named him as Barto Pedro Orent-Niedzielski, a 36-year-old Polish-born man. The suspect in last Tuesday's attack, Cherif Chekatt, was shot dead by police on Thursday. Four members of his family were released on Saturday and two others close to him were freed on Sunday. Only one other person remains in detention. 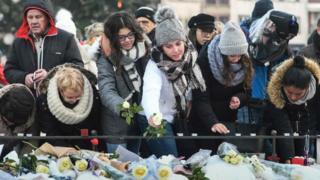 On Sunday, hundreds of people gathered around a makeshift shrine in Strasbourg to honour the victims with readings and songs. Barto Pedro Orent-Niedzielski died at about 18:00 local time on Sunday (17:00 GMT). He had spent five days in a coma and never recovered. His family had kept him on life support so that those close to him could come to say goodbye at the Hautepierre hospital in the city. Kamal Naghchband was a garage mechanic originally from Afghanistan. The father of three had been visiting the market with his family and was shot in the head. Anupong Suebsamarn, 45, was a Thai national on holiday with his wife. Antonio Megalizzi, a 29-year-old Italian journalist, was critically injured in the attack and his death was announced three days later. A retired bank worker aged 61, from Strasbourg, also died. About 10 people remain injured, several seriously. How was the suspect found? As a result of two significant eyewitness reports, an extensive police operation involving a helicopter was launched in the Neudorf area - where the suspect was last seen - on Thursday evening. At about 21:00, the suspect was killed in an exchange of fire with police on rue du Lazaret, France's anti-terror prosecutor Rémy Heitz said. He was later identified through his fingerprints. The officers found an old gun, still loaded, some ammunition and a knife on his body. Seven people were initially arrested in connection with the attack. Cherif Chekatt's parents and two of his brothers were among those detained, but have since been freed. How did Tuesday's attack unfold? At about 20:00 local time (19:00 GMT) on 11 December, a man opened fire close to the famed Christmas market. Mr Heitz said the man had shouted "Allahu Akbar" ("God is greatest") as he opened fire. The suspect was armed with a gun and a knife and escaped the area after jumping into a taxi. As he fled he came into contact with four soldiers, Mr Heitz said, and began firing at them. The soldiers fired back, apparently hitting him in the arm. The attacker told the taxi driver he had killed 10 people, and also said he had been injured during a firefight with soldiers. He ordered the taxi driver to drop him near the police station in Neudorf. When he got out of the vehicle, he fired at police officers before escaping. Chekatt was born in Strasbourg and was already known to the security services. He was on the "fiche S" watchlist of people who represent a potential threat to national security. He had 27 convictions for crimes including robbery spanning France, Germany and Switzerland, and had spent considerable time in prison as a result. The Islamic State group's self-styled news agency, Amaq, on Thursday said that Chekatt was "an Islamic State soldier" who had "carried out the operation in response to calls for targeting citizens of coalition countries" fighting its militants in Syria and Iraq. Strasbourg shooting: Who are the victims?